Colm Cooper recalls the day when he was caught in the middle of a row between Jack O’Connor and Kieran Donaghy. 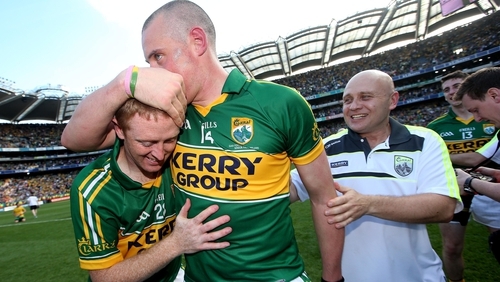 The Gooch was Kerry captain in 2012 with O’Connor as manager and Donaghy, who announced his retirement from inter-county football on Tuesday, one of the most important attacking options on the team. It emerged that Donaghy was planning to travel to Munich to watch Chelsea, the Premier League team he has supported since he was a boy, in the Champions League final against Bayern. "Jack rang me and told me to make sure he wasn’t on that plane!" recalls Cooper with a smile. This was just a week before the Kingdom’s Munster opener against Tipperary, their first Championship game since the previous season’s All-Ireland final defeat to Dublin. The situation was made even worse when the big full-forward turned up late for an in-house practice match because the family dog had gone missing. Tensions in the camp were running high. Cooper says: "He went to watch his beloved Chelsea and I was caught in the middle! I had to act as the mediator, but he was going and that was that." Donaghy went and was dropped, though this is merely a footnote in the playing days of a Kerry football great who won four All-Irelands, three All Stars and was named 2006 Footballer of the Year. Chelsea won that game too, beating Bayern on penalties, so it was all worth it. "He owes Kerry nothing and he’s a hero to Kerry people; they love him and at open nights he was always the one the kids wanted to meet. He has that X factor," said Cooper, who formed a formidable double-act with Donaghy in the Kingdom inside line. "He had vision – he saw it a second or two ahead of everyone. Not only had he to jump over three guys, he knew where the ball was going to land and he was there. "He was asked to play with all different sorts of players – there was Tommy Walsh and the twin towers, and there was me who is a bit smaller, he played in midfield, wing forward and that showed his adaptability. I don’t think his skill set was acknowledged by most people." Some players have problems adjusting, but he’ll have no problem. He’s a real family guy, so that will take up a lot of his time. Donaghy and Cooper are both 35 years old and played underage together with Kerry, though at club level they were rivals on big town teams – Tralee’s Austin Stacks and Dr Croke’s of Killarney respectively. As the teen sensation the Gooch was brought onto the Kerry panel in 2002 and won his first All-Ireland the following season. Donaghy had to wait until 2005 for his call-up after a 2004 stint on TG4’s reality television football show The Underdogs. "Then he burst onto the scene in 2006. No one doubted his ability, but the question was where could we fit him in because he had a lot of quality in the team," explained Cooper. "He got his chance at full-forward by default really because we weren’t going well and he reignited our season. He started full-forward against Longford in a qualifier in Killarney and then he got the goal against Armagh the next day. We didn’t look back after that." Cooper and Donaghy are close friends having played alongside each other and roomed together on Kerry away trips. He plans on trying to take a few quid off him on the golf course now that they both have more time on their hands. Cooper is an all-time great and he acknowledges that his former team-mate helped improve him as a player on and off the field. "He had an infectious personality, he was a pleasure to play with an the perfect team mate. No matter what the situation he could always see the chink of light, he was always positive," Gooch said, speaking to RTÉ Sport. "He took some of the attention off me on the field and he helped my game. I felt very comfortable beside him. In ’06, ’07, ’08 I felt we were unstoppable. "He changed my mind. I was very driven and I expected very high standards. He opened my mind and he taught me to look at situations in more positive ways. "I’d have been very critical when I’d look back on a match I’d be very hard on my own performance and on the team’s. He’d say, ‘look, 90% of what we did was right and the other 10% we can work on’. "I’ll be able to take a few bob off him on the golf course now. We play regularly enough and he’ll have no excuses now. He’s playing off 14, but he’s a single handicapper really," said Cooper. "Some players have problems adjusting, but he’ll have no problem. He’s a real family guy, so that will take up a lot of his time. "But I’m very happy for him; he’s coming out of it in reasonable shape and that means he’ll be able to enjoy his football with Austin Stack and his basketball and for that I’m delighted."